Heir Hunters is the modern name for people or firms who trace missing beneficiaries to deceased peoples estates across the world. Making a will – a testament or instruction as to whom inherits your assets after your death is not compulsory, but a voluntary act which many people make to ensure the people they want inherit money, property, businesses and personal belongings. For various reasons some people just do not make a will, and if that is the case the law takes over to ensure the deceased’s assets are distributed to their next of kin, some potentially that they are not aware of, or have ever met. If no kin is ever found or comes forward to claim then the state inherits the estate. 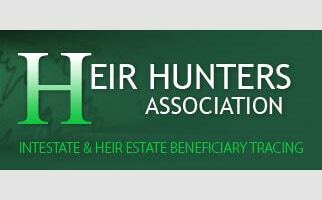 The Heir Hunters Association is committed to supporting aspiring, part time or full time probate Researchers (aka Heir Hunters) Estate Beneficiaries and Associated Probate services such as lawyers and will writers. You can subscribe regardless of location – UK, Europe, North America, Canada, Australia. New Zealand, South America, Africa or Asia since, although inheritance laws may differ across countries, regions, counties and states many principals stay the same. The starter educational option subscription is for new and fledgling Heir Hunters, members of the public or news media and is available on a 3 month ongoing basis at a cost of £25.00 GBP. Access to over 10,000 unclaimed estates updated constantly. We also show new and resolved cases from previous results. A high proportion of these estates have been with the Treasury Solicitor for a number of years and therefore not subject to the fierce competition of new listings which enables you to work through cases in your own time (you have up to 30 years from the date of death). Access to every USA State Department who handle the distribution of unclaimed estates and monies, plus investigators handbook to help locate and submit claims. Details of how to submit a claim to the GLD/BV and handle or administrate the estate after success claiming it or behalf of your fee paying clients.